Ron’s Home Style Foods of Houston, Texas, is recalling approximately 6,912 pounds of ready-to-eat (RTE) chicken salad. The products may be contaminated with Listeria monocytogenes. 5-lb. bulk packages of “Ron’s Home Style Foods CRANBERRY PECAN WHITE MEAT CHICKEN SALAD” with a “Use by” date of 11/25/2018. 5-lb. bulk packages of “Ron’s Home Style Foods CHICKEN SALAD SUPREME” with a “Use by” date of 11/25/2018. 32-lb. bulk packages of “Ron’s Home Style Foods THE SANDWICH FACTORY CHICKEN SALAD” with a “Use by” date of 11/16/2018. 32-lb. bulk packages of “Ron’s Home Style Foods HONEY PECAN WHITE MEAT CHICKEN SALAD” with a “Use by” date of 11/21/2018. 12-oz. plastic container of “Texas Kitchen Salads Cranberry Pecan White Chicken Salad” with a “Use by” date of 11/25/2018. 12-oz. 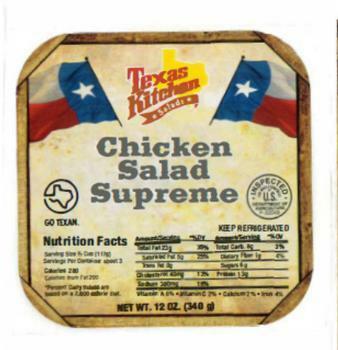 plastic container of “Texas Kitchen Salads Chicken Salad Supreme” with a “Use by” date of 11/25/2018. The recalled products, bearing establishment number “P-32049” inside the USDA mark of inspection, were shipped to institutional and retail locations in Texas. Consumers with questions may contact Brandon Woodall at (713) 640-2082.